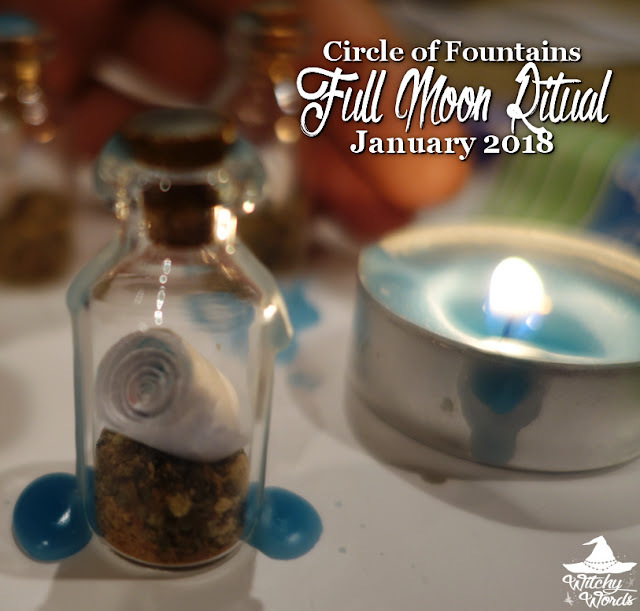 On Sunday, January 29th, Circle of Fountains met to celebrate the upcoming Super Full Blue Blood Moon and work on the Noviceship courses for 2019! We started downstairs in the theater as everyone gave their 10-15 minute presentation about their section of witchcraft history. Starting with Egyptian and Grecian magic and going all the way up to the Satanic panic, modern Satanism and techno witchcraft, the second class of 13 is complete. I just have to merge everyone's research and Powerpoints together! I'm super proud of my circle for doing this. I think our new Noviceship program will be far more comprehensive and informative than prior years. We then headed upstairs for ritual! For this ritual, we came together for a friend of Phaedra's, Becky, who was diagnosed with breast cancer. Phaedra lit incense and then past around a jar of herbs for each of us to charge. A candle was then lit and left to burn down until the herbs caught fire. Wax and herbs would later be put into a red pouch - a color specific to Becky - and sent to her. We hope that our healing energy helps you on this difficult road and wish you the best of luck, Becky! We then sat down for a spell led by our most recent Noviceship graduate, Alisa! Alisa brought small bottles of herbs and gemstones that she had left to charge on the prior January full moon - perfect for this blue moon - and strips of paper. She asked each covenmate to choose a bottle and a slip of paper along with a colored pen of their choice. For this full moon, she asked us to set an intention or goal for the year. Alisa specifically wanted us to focus on something that may be difficult to achieve. Once complete, we were to roll the strips of paper up and place them in the jar, then charge them with our personal energy. Some of us chose to seal our bottles with ribbon or wax. Others chose to leave them unsealed so that they could place other items inside later. You can see my completed bottle above! I keep all items from our rituals on the second shelf of my faery/water altar. Having recently just cleaned this altar out for the new year, this is the first item I've added for 2018! With that, we closed the circle! Congratulations to Alisa for completing her first CF ritual! We're so proud of you! From my family to yours, have a blessed Full Super-Blue-Blood Moon!